I was very interested to read the article by Derek A. Bayliss in RECORD 39 entitled "Middleton-in-Teesdale". He concludes, "Perhaps someone else can carry on from here?". I must congratulate Mr Bayliss on the amount of information he obtained in a week, but as is very often the case in such investigations, both he and others who have commented on his article make certain errors and omissions for various reasons. I contribute this "follow on" article, having some practical knowledge of the area and, in addition, having done some recent research into the industrial history of the dale. In Great Eggerhope was situated the largest group of mines ever operated in Teesdale by the London Lead Company. The bulk of the ore produced by these mines was dressed at a large plant situated between the ford over the beck and the mineshops (NY 978298), although some dressing was done at Wiregill which was one of the main mines in the group. Smelting was not done here but at Blackton Smelt Mill about four miles away. 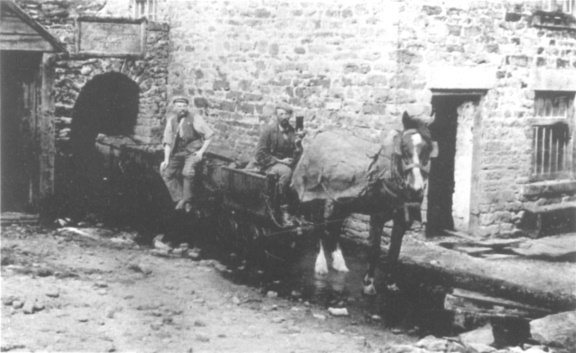 Much track was involved and horse transport was used both inside and outside the mines to deliver the ore to the dressing mill. A photograph is included showing this method of transport. The flat type of rails shown in the drawing on page 135 of RECORD 39 are colliery rails and relate to later mining; that is, attempts made from time to time during the present century to recommence mining. The "T" rail was almost universally used and it fitted snugly into the chair which was secured to the sleeper by wooden plugs. These were a driving fit into the holes made in the sleepers by an auger. Chairs were placed every three feet and were located by a taper pin driven through the chair and rail and bent over. There was another type of "T" rail used which necessitated sliding the chairs on from the end. These rails only had two pin holes, one at each end. They were considered a nuisance, but they had certain advantages. The gauge was always referred to as 21 in, but the heavy wide wheels used on the mine wagons made an inch neither here nor there. Low Quarry (NY 947246), Crossthwaite Quarry (NY 926254) and Park End Quarry (NY 923257). These were Whinstone Quarries worked by Ord & Maddison Ltd until 1962 when the company was taken over by Tarmac Roadstone Ltd.
Lunedale Limestone Quarry (NY 954238) and Greengates Whinstone Quarry (NY 935235) both had a common siding at NY 956243; the last proprietors were the Lunedale Whinstone Company. Mickleton Limestone Quarry (NY 972230) alongside the Barnard Castle to Middleton-in-Teesdale branch line had loco access and was worked by the Cargo Fleet Iron Co Ltd.
Each of these three systems is of sufficient interest and scope to warrant separate and extensive research to establish the track, locos, method of use, period covered and so on. The railway system at Cowgreen Barytes Mines was extensive and interesting, but it could never be fully researched without the help of someone with accurate local knowledge reaching back to the early part of the century. The first track was laid in 1918 to connect Low Level Mine (NY 811305) with Cowrake (NY 825313), which was established as a collecting point and washing floor, and from which was despatched the dressed product by overhead ropeway to the main road at a point 250 yards north of Langdon Beck Hotel. About the same time, a track was laid from Isabella Mine (NY 816317) to a rise (shaft) from Hopkins mine (NY 819314) down which the barytes was tipped so that it could be brought out of Hopkins Level to Cowrake. That is why the track ends so abruptly for no apparent reason. When an attempt was made by the Harwood Mining Company (nothing to do with the Consett Iron Company) to re‑open the mines in 1923, track was laid from Dubby Sike Mine (NY 796320) to join the Low Level - Cowrake section at Cowgreen Top (NY 815307). Horses were used to draw the wagons on all these lines. None of the Cowgreen track was removed until 1938, after the mines were re‑opened by the Wrentnall Baryta Co Ltd. This company constructed the road from Langdon Beck to Low Level and Dubby Sike and lifted all the track which was gradually used underground where it remains buried since mining ceased in 1954. Sharnberry Mine (NZ 013307). An incline about half-a-mile long connecting High and Low Sharnberry Mines; further details and the method of operation have still to be ascertained. Great Eggleshope Mine. Brief details are given by Bayliss on page 134. Coldberry Mine (NY 943291). About 200 yards of track connected North Level (from which the bulk of the ore was brought) with the dressing mill, in addition to many shorter sections about the mine workings. Greenhurth Mine (NY 783327). Some 500 yards of track connected Swan's Shaft, from which the ore was drawn, with the dressing plant. This was an incline; further details and the method of operation have still to be ascertained. Bowes Wood Close, Harwood. During the 1914‑18 War, owing to the shortage of imported timber, Harwood Plantation was completely felled and the timber was brought up from the bottom of the valley (NY 830324) to the main road at NY 833327 on track laid for that purpose. Properly constructed bogies were used and operated by single rope haulage. The winding drum was driven by a steam engine or tractor. Grassholme Dam (NY 947227), built in 1901‑14 by John Scott for the Tees Valley Water Board, was connected by a standard gauge line to the Barnard Castle to Middleton Branch line at Pipely Bridge (NY 964236) where the remains of the sidings can still be seen. Several locomotives were employed, and the full story is recounted in a lengthy article by Harold D. Bowtell in the June 1973 issue of the "SLS Journal". Whistle Crag Quarry (NY 975247), which was opened in 1931 by Waller & Stokoe. Due to its inaccessible location by the river Tees an incline about 300 yards long was put down from the side of the main road at NY 976248. This descends 200 feet in that distance and was operated by single rope haulage powered by a "Chase" petrol engine from a motor lorry, adapted for the purpose. The incline operated until 1933 when the quarry was closed. I have purposely refrained from complicating the preceding notes by the inclusion of the following which refer to more recent years. Towards the end of the last period of working of Cowgreen Mine (1937‑54) horse transport was replaced by three Wingrove & Rogers BEV (British Electric Vehicles) four-wheel battery driven locos on 1ft 6in gauge track used throughout the mine. During the last period of working at Coldberry Lead Mine (ending in 1955) two Hunslet 1ft 10in gauge four-wheel diesels were used both inside and outside the mine. Close House Barytes Mine (NY 850227), which is the only active mine in the area at present, employs three Wingrove & Rogers four-wheel battery driven locos inside and outside the mine on 1ft 10in gauge track. One of the locos employed here started life at Cowgreen although it was obtained from Settlingstones Witherite Mine by Athole G. Allen (Stockton) Ltd, the owners of Close House Mine. This account does not deal with any of the hand-operated track which was at one time quite extensive in many of the quarries. Neither does it cover any of the underground (mine) track which totalled well over a mile in some of the larger mines, apart from the inevitable references in details of later mining. Two articles of mine in Durham County Local History Society Bulletins Nos.9 and 11 give further details of "The History of Cowgreen Mines" and "The Lead Smelting Mills of Teesdale and District". The official photograph used by John Fowler & Co (Leeds) Ltd in this advertisement depicts Fowler 16023, an 0‑6‑2 side tank built in 1923 for Sena Sugar Estates Ltd, Mozambique, their No.3. The loco was the last of a batch of three (16021‑23) built for SSE; these had 12in by 16in cylinders and were for 3ft gauge. A full page illustration of Fowler 16023 appears on page 13 of the Fowler catalogue reprinted by the Society, copies still being available (price 50p post free) from IRS Publications, 44 Hicks Avenue, GREENFORD, Middlesex.